The new ZTE smartphone Axon 7 Max presents 3D effects on a 6-inch screen without the users having to wear special glasses. In addition, the Axon 7 Max's dual camera can capture 3D photos and videos. The new ZTE smartphone Axon 7 Max is very large, with its Specs but in the mid-range segment: it offers a 6-inch full-HD display and is powered by the Qualcomm chipset Snapdragon 625 with octa core processor. It comes with a 4 GB memory and a 4,100 mAh battery with Quick-Charge 3.0 support. 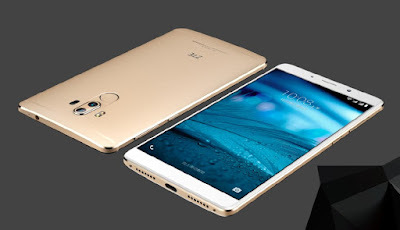 The internal memory space of the device is limited to 64 GB and can be extended up to 200 GB via microSD card, but no dual SIM operation of the smartphone is possible. For photo and video recording, a dual camera with 13 megapixel and laser autofocus is available. For video telephones, there is a 13 megapixel resolution front camera. The Chinese producer referred to the display of Axon 7 Max "revolutionary". It produces in accordance with the pictures or Animation a "Naked 3D" designated 3D effect, so that users can view 3d effects even without special glasses. According to the manufacturer's instructions, the dual- Camera of the ZTE Axon 7 Max with f / 2.0 for the creation of 3D content and shoot black and white shots. A competition running in mid-November is supposed to push the 3D-pictures on smartphones. Other features of the ZTE Axon 7 Max running on Android 6.0 are USB Type C, a 3.5 mm jack and a dedicated audio chip (AK4962) for sound output via headphones, WLAN, UMTS / HSPA + and LTE for Internet access and the Internet Media streaming as well as a fingerprint sensor. In China the Phablet can now be pre-ordered for 2.999 yuan, the regular market start on November 3.